Origin of name  Frank Lloyd Wright modified the name Old Brass to Auldbrass. We define a plantation as a large farm on which most of the work was done by slaves. Thus all the plantations we catalog were established before the Civil War. 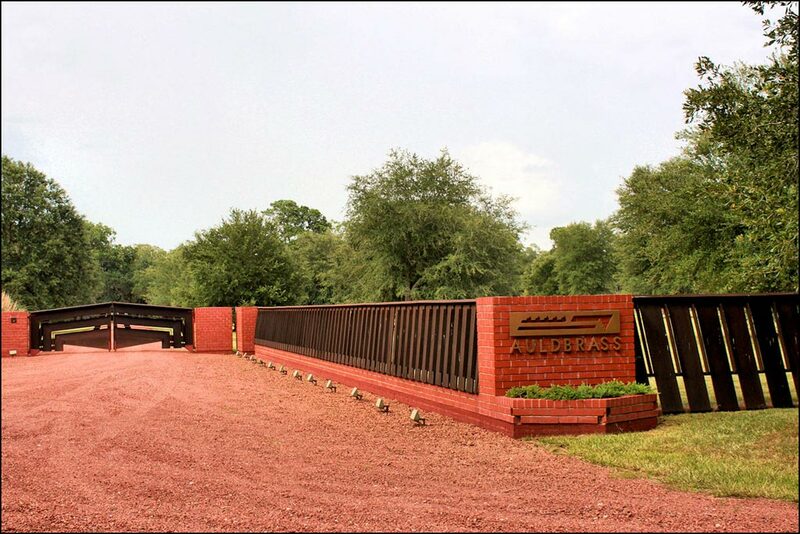 Auldbrass was established in 1938 from the combination of several plantations in the area. This new plantation never grew crops on a commercial scale or used slave labor. 1938  C. Leigh Stevens reorganized the Savannah River Lumber Company, and as a fee for his services the company gave him several tracts of land. C. Leigh Stevens combined Old Brass (formerly Mount Pleasant), Mount Alexander, Richfield, Old Combahee, and Charlton to form a large piece of property. He then commissioned Frank Lloyd Wright to build a plantation complex that represented a working farm. Frank Lloyd Wright is given credit for naming the complex Auldbrass (9, p. 425). 1940  Wright had all the initial drawings and plans finished. Hexagonal shapes and inward-sloping walls were the main design features of the house and complex. The following buildings were to be part of the complex: Stable and Kennel, Caretaker's Cottage, Guest House, Main House with a detached kitchen, Farm Buildings, Staff Cabins, Swimming pool, and Laundry and Bath Houses for the staff (7, p. 60). Construction began in September. One problem that the contractors would face throughout the whole project was the shortage of materials coming to the United States as a result of the war in Europe (7, p. 96). 1941  The farm buildings were nearly completed and the main house was in the beginning stages (7, p. 115). 1942  By December all worked had stopped on the construction of Auldbrass. Stevens was running low on funds due to the war, and as a result, creditors were hounding him to receive their payments (7, p. 125). 1946  Stevens was ready to resume construction of Auldbrass and complete the main house. He decided to move into Auldbrass and first occupied the nearly completed caretaker's cottage, more or less camping out (7, p. 132). From 1946 to 1948 not much, if any, work was done on the complex. Stevens became involved with Harvard as a Visiting Lecturer at the Business School. He would remain there until his death in 1962 (7, p. 136). 1950  Up until this point Stevens wives had never had any interest in what was going on at Auldbrass. However, Stevens third wife, Nina Lunn, took an interest in Auldbrass and started to direct the workers herself (7, p. 137). Since the beginning of the project Wright's designs had been modified and changed numerous times by Stevens and now by his third wife, Nina. The original plans had been designed for a bachelor's lifestyle. With the addition of a female into the picture, the designs changed again to reflect her wants. 1952  In March, a fire destroyed portions of the farm buildings. The fire began in a large detached barn but quickly spread to the hay barn and machine shed. The volunteer fire fighters were able to hack down the roof that connected the barns to the caretaker's house, stables, saddle room, cook shed, and kennels. The main house and staff cabins were not affected (7, p. 149). Stevens did not have the buildings replaced. Instead, he built a small hexagonal shed to store tools and house electrical switches (7, p. 149). 1959  Frank Lloyd Wright died. Stevens died three years later of a heart attack. Auldbrass would remain unfinished until 1987 when Joel Silver purchased the complex and proceeded to restore and finish Auldbrass the way Wright and Stevens had imagined it in the beginning (7, p. 166). 1962  C. Leigh Stevens died and he gave Auldbrass to his son and daughter. His daughter, Jessica Stevens Loring bought out her brother's share of Auldbrass and proceeded to try and manage the complex. 1971  Jessica and her husband, Stanton, moved into Auldbrass permanently in order to manage it more efficiently. They proceeded to make extensive repairs to the buildings. They replaced the roof and upgraded the mechanical systems. They tried their best to reverse the changes made by Nina Lunn. The Lorings also had to deal with visitors who had an interest in Wright's work. The visitors were always given a tour and welcomed in. 1976  To help make sure the property would always be protected and recognized as a Wright project, the Lorings had Auldbrass nominated for the National Register of Historic Places. 1979  Due to the constant upkeep of all the buildings and land, the Lorings sold Auldbrass to Boise Cascade, a timber company. However, they kept the Old Combahee tract for themselves. Almost immediately the land was sold to Westvaco Corporation. Westvaco sold the buildings and a small parcel of land to a group of local hunters. 1980s  The hunters found the management of the buildings difficult, and they gradually fell into ruin. The hunters realized the buildings were not well suited to their needs and tried to donate them to Clemson University for an architectural restoration center. Working with the Beaufort County Open Land Trust it was decided to place an easement on the property and offer the place for sale at a drastically reduced price. 1986  Joel Silver, who had just finished restoring another Wright building in California, was contacted about purchasing and saving Auldbrass. Silver made a donation of $148,000 to the Open Land Trust with an agrement that he house and property would be open for tours on occasion. Silver became the next, and current, owner of Auldbrass (7, p. 189). Silver planned to restore the complex in four stages. First he would restore all of Wright's original buildings as he had originally designed them, retaining as much original fabric as possible. Second, all Wright-designed buildings that had been destroyed or altered beyond recognition would be rebuilt using materials as close to the originals as possible. Third, Wright's unbuilt projects for the complex would be built as he had designed. The exterior would look like the original designs, but the interior would be organized to meet current needs. Fourth, the buildings needed by Silver would be added, designed to mimic Wright's designs, but located at a distance so as not to intrude on the original complex (7, p. 211).